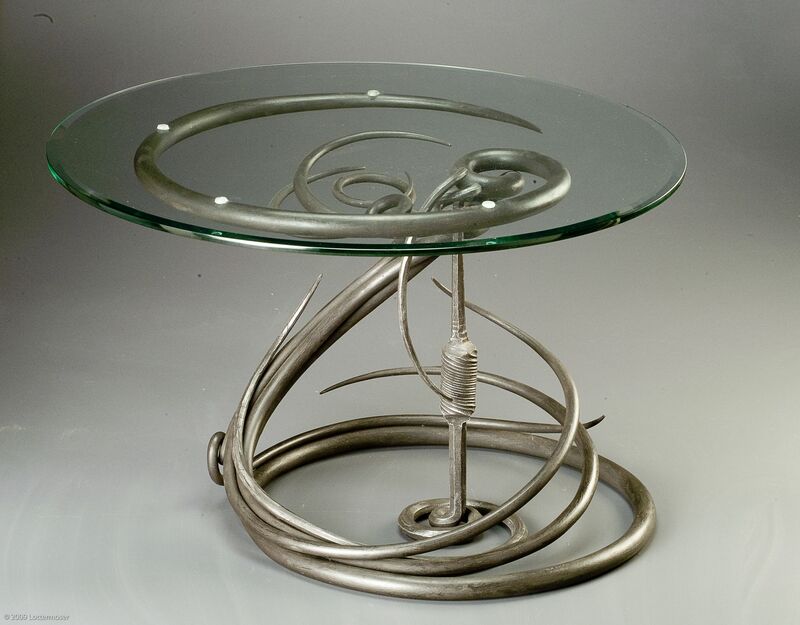 Dan Nauman began forging in 1979. He has traveled the US to learn what he can from others about forging. He has operated out of his studio in Kewaskum, Wisconsin since 1987. 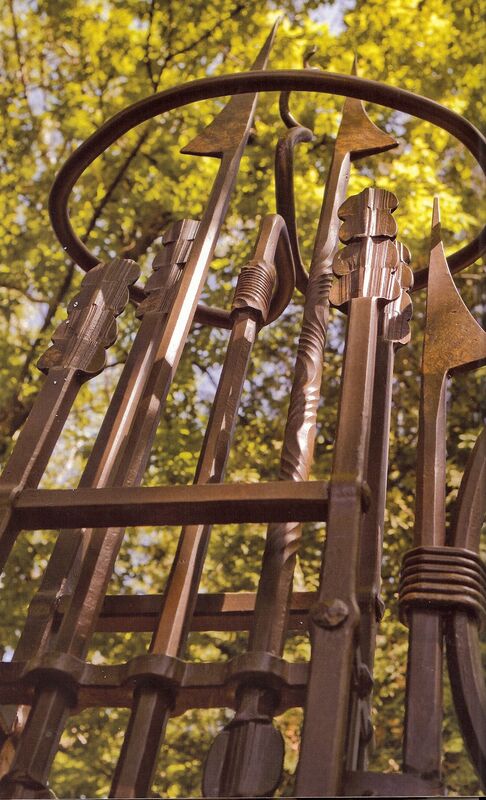 In 1990, Dan incorporated Bighorn Forge, Inc., and began forging full time in 1993. From 1995 to 2002 he operated an additional shop in Baileys Harbor, WI. He added another shop in Cedarburg, WI in 2000, and operated that shop until 2006. Today, all his work is performed at the studio in Kewaskum. 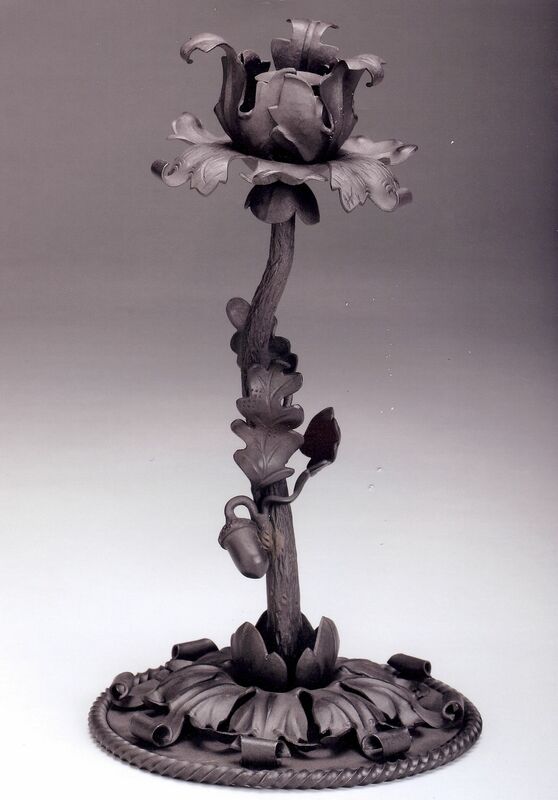 Dan has taught, demonstrated and lectured on forging at many conferences, workshops, trade schools, colleges, and museums around the country, and also at his studio in Kewaskum. 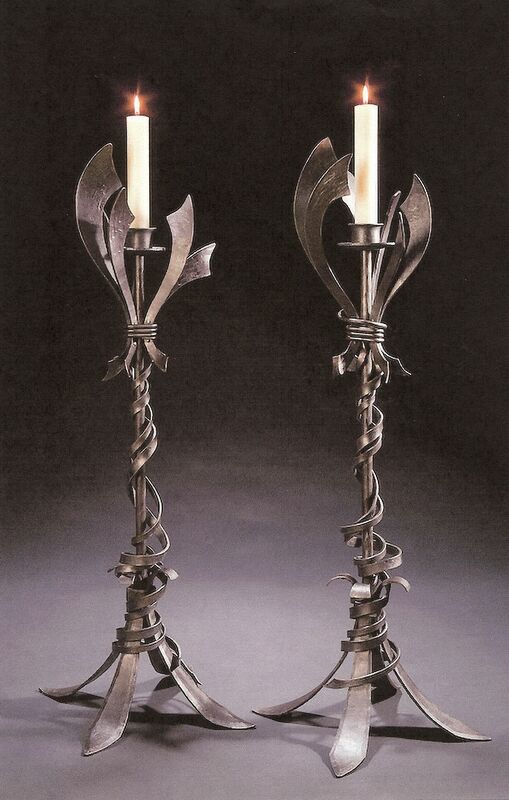 In 1998, he was the Project Director for a video entitled “Forged Elegance, the Lifework of Master Blacksmith Cyril Colnik”, which aired on Wisconsin and Milwaukee Public Television stations. 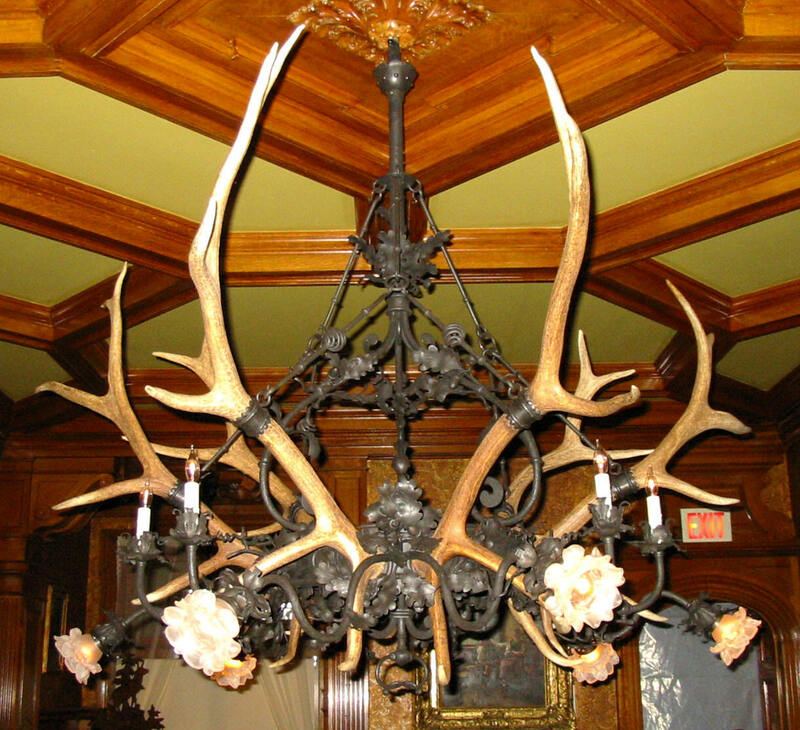 Dan has won two international awards for his design and worksmanship from the “National Ornamental and Miscellaneous Metals Association” (NOMMA) for a chandelier made for the “Captain Frederick Pabst Mansion” in Milwaukee, WI, and for a sculptural gate made for a private party residing in Port Washington, WI. 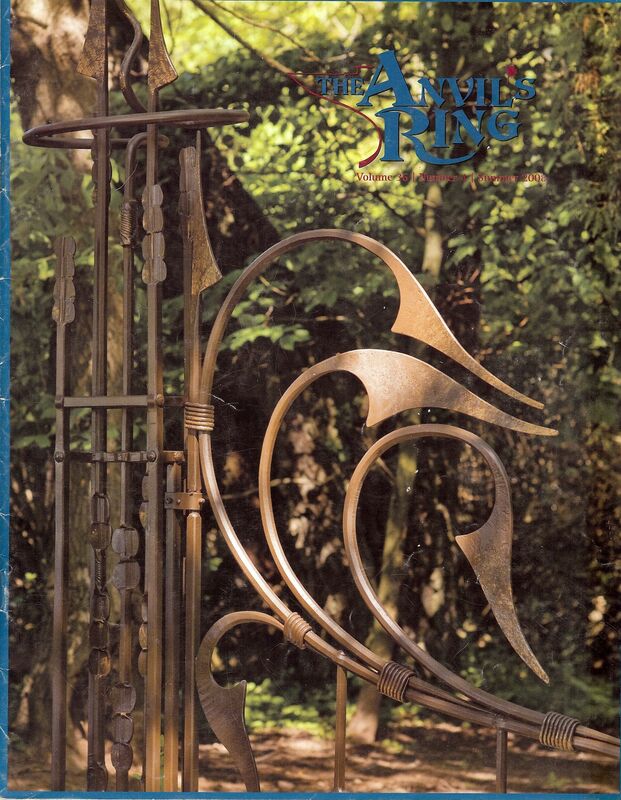 Forging in the tradition of the old-world craftsmen, Dan designs and makes gates, railings, door hardware, furniture, lighting, fireplace equipment, and sculpture, in many different styles for homes, businesses, and institutions. 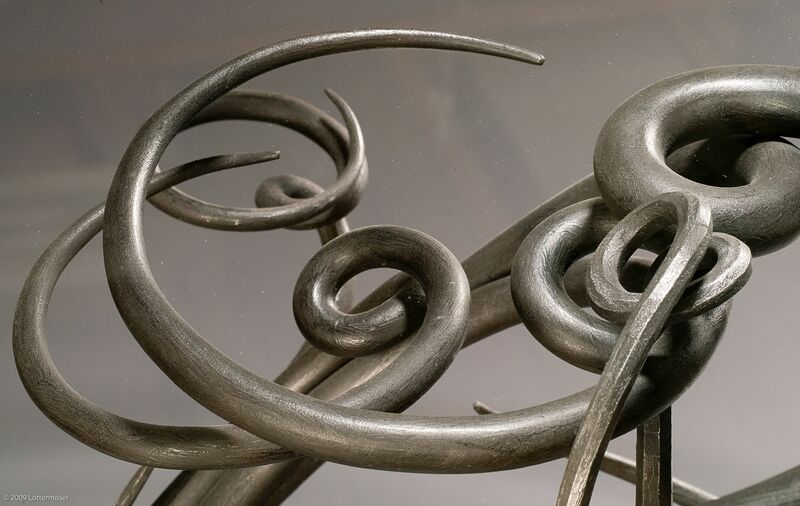 He has served two terms as a board member for the “Artist Blacksmiths Association of North America” (ABANA) an international blacksmith’s association, from 2000-2006. He chaired a committee of seven which wrote lessons in forging for one of ABANA’s trade magazines from 2002 to 2009. 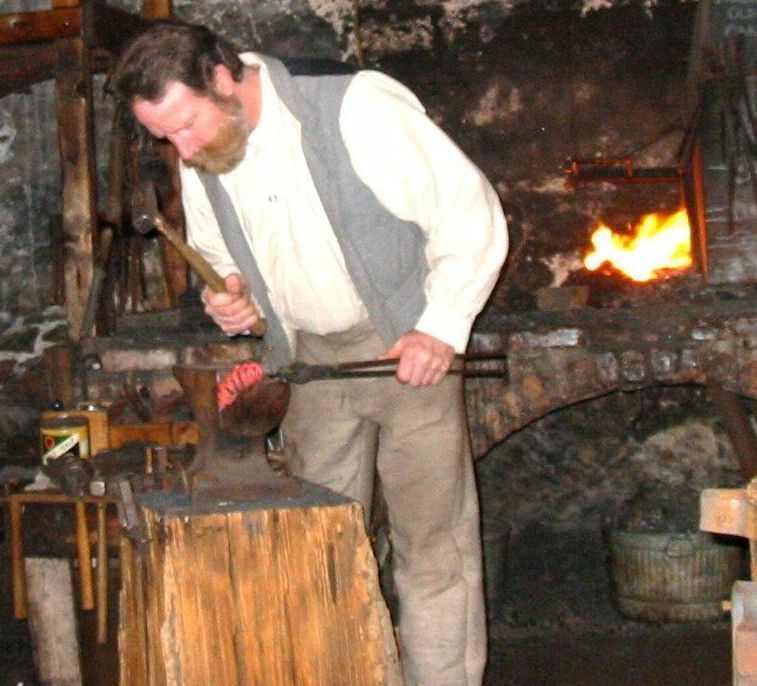 The lessons are called “Controlled Hand Forging”, and include over 25 installments in forging process, shop layout and shop safety. He considers forging to be a continual learning process, with never-ending possibilities. 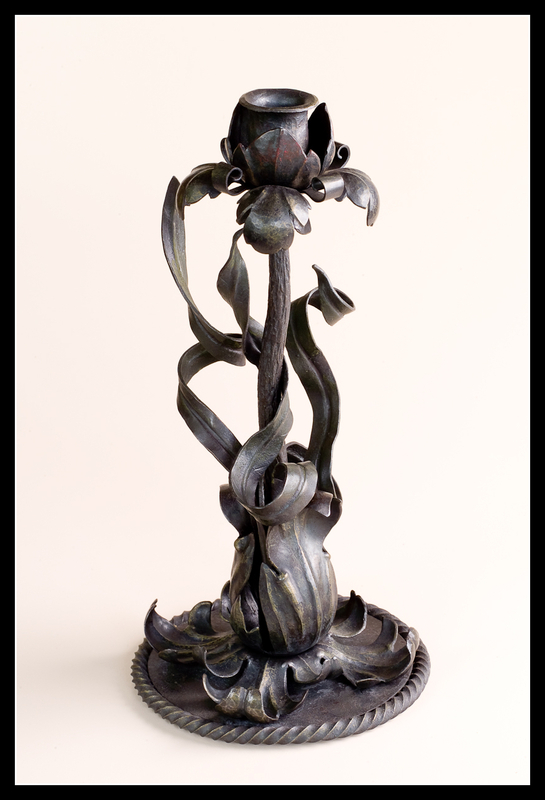 His work is widely varied, highly detailed and imaginative, including flowing forms, different metals, applied colors, and also utilizes the various processes of repousse’. His work can be found in many of the finest homes in this country. In recent years, though he always thrills in classic style, his attention has been directed towards more sculptural elements, and also pure sculpture. Glad you find this a help. I’ve been a member of ABANA for the past 2 years now and to be honest, have not gained much in the way of what they make themselves out to be and the education they offer. It seems to me that each and every time I tried to find help on questions or techniques from either a local smith, or even one halfway across the Country (this including Dan), I have been ignored and have still have yet to find any point in wasting my hard-earned money on a membership with ABANA. The organization continues to preach that they are there for help and instruction to anyone interested in the craft, but when it comes time to step up, they’re too busy or off tooting about some project they’re working on. When is ABANA going to step up and practice what they preach? I think taking a look at why the Association was formed should be reaccessed. As for me, I’ll never waste another dime on ABANA and if you ask and watch and listen, you’ll find quite a few others who feel the same way. The egos and reputation and accomplishments have outweighed the basic principle of helping others interested in the craft and if there’s anything or anyone that will kill off Blacksmithing, it’ll be those who don’t have the time to respond to an email or phone call. Or of giving a little time to explain a technique or just be open to suggestions.Just my opinion, but ABANA has become a bit too elitist for us just learning and I think it’s sad. Hello Greg. I was on the ABANA Board of Directors for six years, from 2000-2006. My goal was to try and change things, specifically education, to try and make ABANA mor eof a resource for aspiring and established smiths alike. The result was “Controlled Hand Forging”, which is a series of forging lessons that are available online via ABANA’s website http://www.abana.org. Once on the web-site, look for “CHF Lessons.” I also lobbied for ABANA to cater to professional smiths, as there has been a huge drop-off in membership in this category, for various reasons. Before I delve into these reasons, we need to look a bit at ABANA’s roots. 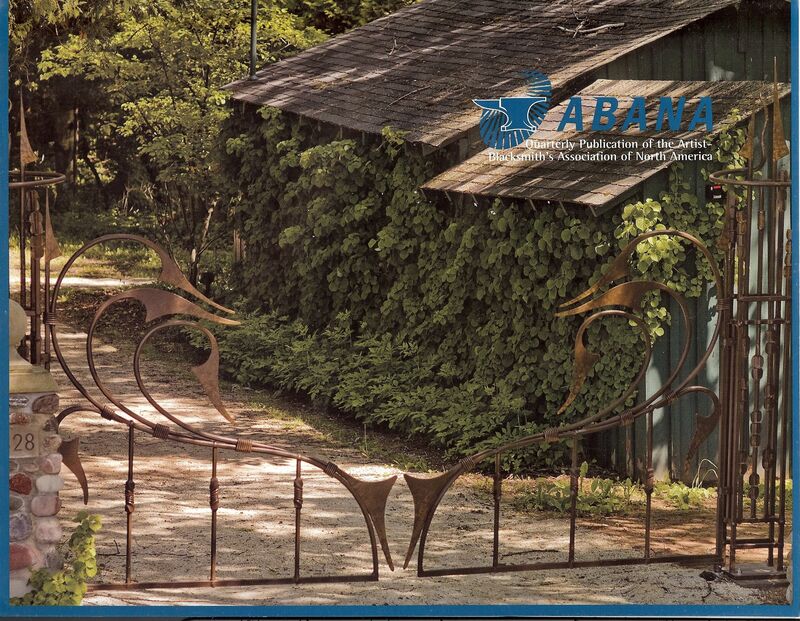 ABANA began in 1973 in Lumkin, GA, with about 20-30 like minded individuals, searching for forging knowledge. Blacksmiths earning a living in the trade were scarce back then, and for the most part, everyone’s experience (skill level) was pretty basic. The differences between individual experience were minor. ABANA grew, and as a result, many local chapters, (today called “Affiliates”) were formed. The magazine, as well as the organization, was largely run by experienced smiths for many years, which was good, as leaders need to know where to lead people. Without solid knowledge, you essentially have the blind leading the blind. As the years passed, the chasm between novice and seasoned smith grew larger. More folks were forging for a living. Some began to be very successful, with some to the point of being nationally and internationally known. Now, let’s briefly also look at how the organization is run. ABANA is a 501 C 3, non-profit organization, run by 15 board members, plus a paid secretary, as well as two paid magazine editors. Yearly elections by the membership determine who is on the board. The board hires/fires the paid positions. Since the board is made up of non-paid personnel, they are all volunteers. Almost articles submitted to the publications are from unpaid ABANA members, with an ocasional few articles being written by the “Hammer’s Blow” editor. Here is reality with ABANA/forging today. ABANA’s membership is likely 90 to 99% hobbiest, or part-time smiths. There is also no way to determine what a person’s experience, or skill level is, i.e. we all know what a beginner is, but what denotes an intermediate or advanced smith? There is also a blurred line between forging and fabrication, i.e. hot-forged work vs. MIG, TIG, and arc welding elements together. Professional smiths tend to be more experienced, and their needs and interests are vastly different than those of a beginner or hobbiest. Here are the problems as I see things. Because ABANA is largely comprised of beginners and hobbiests, the base of what shows up in the publications is mainly beginner/hobbiest related. To my knowledge, the ABANA board is currently comprised of mainly non-professional smiths. Because of these as well as aforementioned reasons, the small percentage of professional smiths have declined steadily over the last 15 years. Their needs are not being met, i.e. 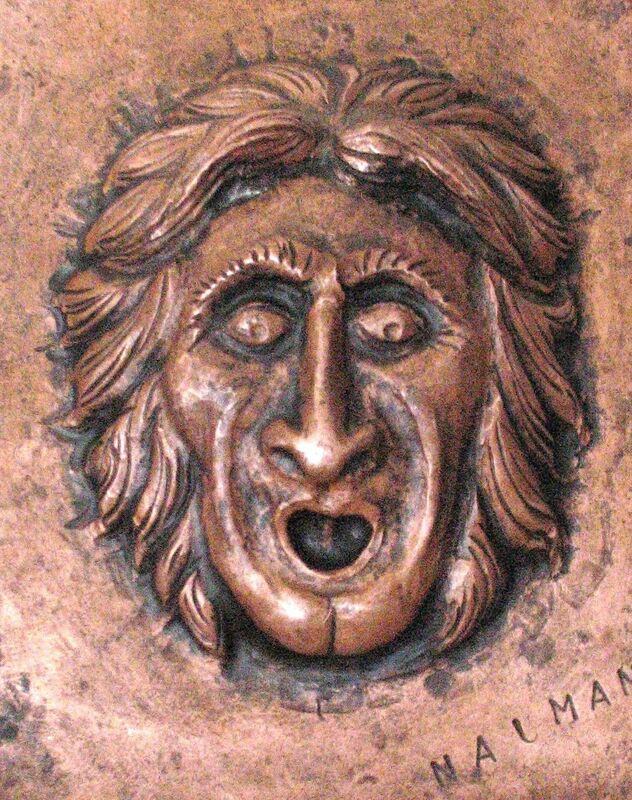 how many articles can you read about forge-welding, wizard heads, and bottle openers? Without experienced leadership, what do you have? ABANA has also never had any pointed direction for a learning smith, or how a smith should learn process. That is a vital breakdown in leadership. 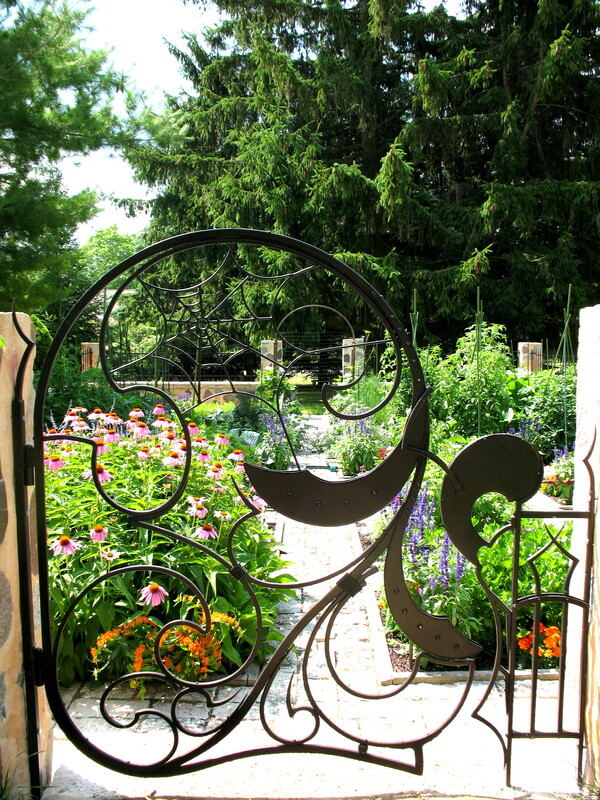 I look at an organization such as the National Ornamental and Miscellanious Metals Association (NOMMA), and they have their act together, as they are all about the business of fabrication, and to some degree, forging. They have a first rate publication, dedication to teaching, they pay for articles, they have an annual competition, and they all seem to get along famously. I do not believe they are a 501 c 3 non-profit, and that may be ABANA’s biggest problem. You need to compensate folks for time well spent. Volunteering only goes so far before one just simply cannot afford the time anymore. An incentive goes a long way. It has taken me almost an hour just to type this letter to you….I don’t have the time to do this every day, an expect to stay in business. As for elitists, they will be there in any organization, and so be it. Know who they are and either accept them or reject them. Getting involved in any way you can….yes, even volunteering….will educate you as to who will be an asset to you, and who is simply blowing smoke. However there is a contingeant of proffesional as well as experienced non-professional smiths who continue to educate, but they are few. Get involved, and you will find them. Lastly, if anything is going to truly get smiths on track, I firmly believe that forging should have standards set in place. That has never been accomplished in this country, and it is well past due time, as with so many professionals out there, and so much mis-information, and with so many unqualified teachers of forging, it is a crime we don’t have any in place, and that is the fault of ABANA as well. Without standards, you have nothing to aspire to, nothing to direct others to, nothing to stand upon. It is all then a scatter gun approach to learning. I could go on, but I need to get to work. Hope this addresses some of your objections. 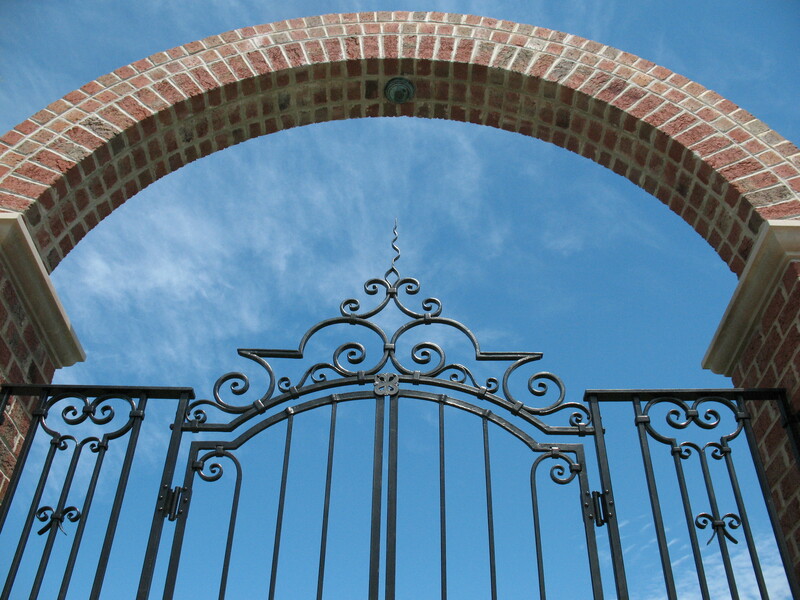 Hi i am a student in Graphic Design and am wondering if i could use your image of the Port Washington Gates?